Miah Cooper doesn't let violence define her community. Imagine attending a party at an apartment complex across from campus, and suddenly hearing gunshots just a few feet from where you’re standing. Saginaw Valley State University student Miah Cooper found herself in the midst of a shooting around 1:50 a.m. on Sunday, September 11, and escaped the premises unscathed while five others were injured. Almost a thousand people attended the party and quickly scattered after the gunman opened fire. A few hundred people, Cooper included, were eyewitnesses, and stayed to give their accounts to police. “I didn’t get home until after 4:30 a.m.,” Cooper said. She woke up at 11 a.m., distressed. Her first instinct was to retell what happened on Odyssey, and to start the healing process of her community. “I felt compelled to write about it,” she said. She submitted her post within two hours. My school is my safe place. My school is not dangerous. My school is not violent, but the world is. 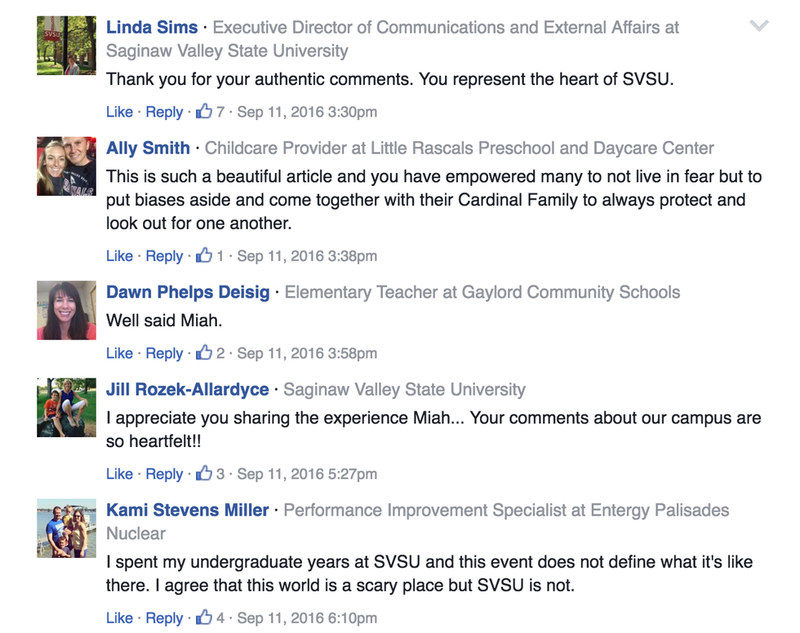 So on this day — and every day — I stand with my Saginaw Valley State University — because we are Cardinal Strong. Within the next 24 hours, her story was resonating so much with other SVSU students and faculty that they started sharing the article on social media. Cooper, whose only intention was to help heal those who had been affected by the shooting, was blown away to find her article was garnering thousands of shares within just a few days of being posted. Multiple students, alumni and family members of SVSU students and faculty thanked Cooper in Facebook comments and messages for helping ease their fears about the shooting, and for reminding them that SVSU is still an incredible place. “This is such a beautiful article and you have empowered many to not live in fear but to put biases aside and come together with their Cardinal Family to always protect and look out for one another,” commented reader Ally Smith. As several news outlets reported on the shooting, ABC12 approached Cooper directly about her Odyssey post, and requested an interview with her. After Cooper’s interview, the dean of her college quickly recognized her as a true leader on campus and invited her to his office. After her visit, the dean made some connections and adjusted the program so Cooper could graduate on time. Almost a month later, Cooper is continuing to make an impact with recent Odyssey articles like “For All You Boys With Baby Sisters” and “20 Things I’ve Learned Before 21,” but her coverage on the shooting forever proved how powerful her voice could be.